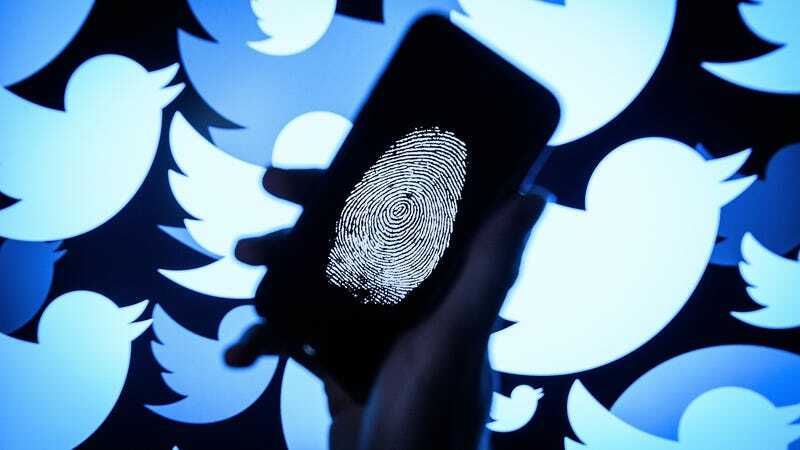 In this photo illustration, a thumbprint is displayed on a mobile phone as the logo for the Twitter social media network is projected onto a screen on August 09, 2017 in London, England. The suspension of the prominent accounts, reported by Axios, came after the US Department of Justice announced Friday that it had indicted 12 Russian military officers on accusations of interfering in the 2016 US presidential election. Both accounts had been dormant for a least a year prior to their removal. Both Guccifer 2.0 and DCLeaks were background players that kept popping up during the madness of the 2016 election cycle. The accounts managed to put their collective finger on the scale by spreading a treasure trove of documents including emails that highlighted the behind-the-scenes dealing that took place at the DNC. The leaks drove the news cycle at times, as news networks scrambled to cover stories about the Clinton campaign’s off-the-record correspondence with journalists, internal skirmishes and debates, and the supposed rigging of primary elections against Bernie Sanders. Guccifer 2.0 often maintained that the account was operated by a lone hacker of Romanian descent, but the Department of Justice linked at least two Russian intelligence officers to the account: Aleksandr Vladimirovich Osadchuk, a Colonel in the Russian military; and Aleksey Aleksandrovich Potemkin. Former Trump confidant and political advisor Roger Stone claimed to have multiple conversations with Guccifer. Though he later attempted to downplay those interactions, he admitted to the Guardian Friday that he is “probably” the unnamed American cited in the indictment. The Guccifer account wasn’t just used to reach out to people. The indictment notes that at one point, a candidate for US Congress reached out to the account and asked for any information that related to the candidate’s Congressional opponent. The Russian agents operating the account complied and sent along the relevant stolen documents. The candidate that reached out to Guccifer was unnamed in the indictment. Last year, GOP operative and operator of Florida political gossip blog HelloFLA Aaron Nevins told the Wall Street Journal that he reached out to the Guccifer account and received stolen documents. Since the 2016 election, Twitter has been trying to purge itself of anything that may have enabled the foreign interference that took place. The company linked hundreds of accounts to Russian propaganda efforts, informed nearly 700,000 users they got duped by foreign actors, and purged millions of bots and automated accounts on the platform.